Mamie is 2 years, 7 months old and 36 inches tall, which is very tall. Her favorite things are dinosaurs, books, cooking, and outside. Right this second, her two chicken friends, Peep and Bok, are talking to each other. Her hair has grown down to her waist band, and she runs when I say the word "ponytail." She is trying to learn the word "skull" but usually says "head bone." Daddy has no head bone because he is a jelly head. She does not nap. You don't have to ask me if she took a nap today, because if she had, I would have called TMZ. She woke me up for breakfast yesterday and said "Happy Mother's Day." Nick said she did not practice. She is so patient and happy while Mommy conserves energy to grow her little sister. 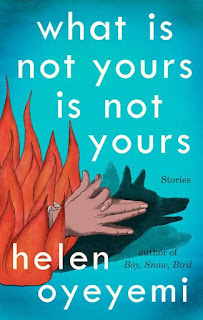 What is not yours is not yours Helen Oyeyemi Mamie likes the shadow puppets on the cover. The library would like for me to return this week-overdue copy because there's a long line of people waiting to read it. "Modern surreal fairytales" is the best description I have heard of Oyeyemi's work, and I'm a fan. This one makes me want to hear ghost stories. Shirley: A novel Susan Scarf Merrell I don't know exactly what to expect yet. How does Shirley Jackson work out as a creepy character outside her own creepy creations?